Chemists have long sought to develop new reactions for the direct conversion of simple hydrocarbon building blocks into valuable materials such as pharmaceuticals in a way that dependably creates the same chemical bonds and orientations. UT Southwestern researchers have hit upon a novel way to do that. The ability to consistently create desirable molecules and avoid undesirable ones could greatly accelerate pharmaceutical production. Many molecules come in two mirror-image configurations, often labeled left-handed and right-handed. Usually, only one of the two is biologically desired, but the issue is more complicated than that, said Dr. Uttam Tambar, Associate Professor of Biochemistry and senior author of a study outlining the reaction published online in Nature. "Unsaturated hydrocarbons contain only two types of bonds, carbon-hydrogen and carbon-carbon. It is very challenging to selectively transform the starting material hydrocarbon, called the feedstock, into a product in which you have selectively transformed one carbon-hydrogen bond into a new bond in every molecule. We are able to do that," Dr. Tambar said. "We are not only dealing with left- or right-handed configuration; we are also dealing with what position of the molecule is chemically modified," he added. The selectivity problem challenges chemists, who often encounter it when attempting to directly transform unsaturated hydrocarbons that contain one or more carbon-carbon double bonds, resulting in difficult-to-separate mixtures of compounds that require subsequent chemical steps to subdivide the mixtures into the desired molecules. "We have developed a method for the direct conversion of a variety of double bond-containing materials into useful products. A specially designed chiral catalyst is used to oxidize hydrocarbons into multifunctional compounds that are obtained in high purity and are readily converted into an assortment of molecules that will streamline the synthesis of future pharmaceutical drugs," said Dr. Leila Bayeh, a former graduate student and lead author of the study. Dr. Bayeh is now a postdoctoral researcher at the Massachusetts Institute of Technology. 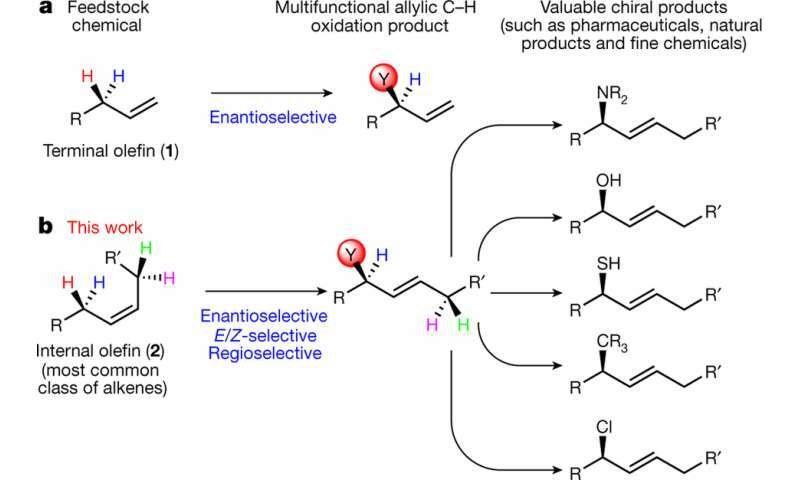 The phrase "chiral catalyst" means that the catalyst that orchestrates the entire reaction has the proper orientation - a left- or right-handed configuration as the situation requires - in order to create the desired chemical transformation, he explained. The orientation and proper location of all chemical bonds is crucial because the wrong molecule generated from a reaction can be ineffectual or potentially dangerous. Hence the emphasis on consistency.